I am using the scheduler but I want to hide the time slots in the calendar. I'm showing only allday appointments in the calendar. Could you please let me know whether you are using ASP.Net Scheduler control or Windows Forms schedule control? 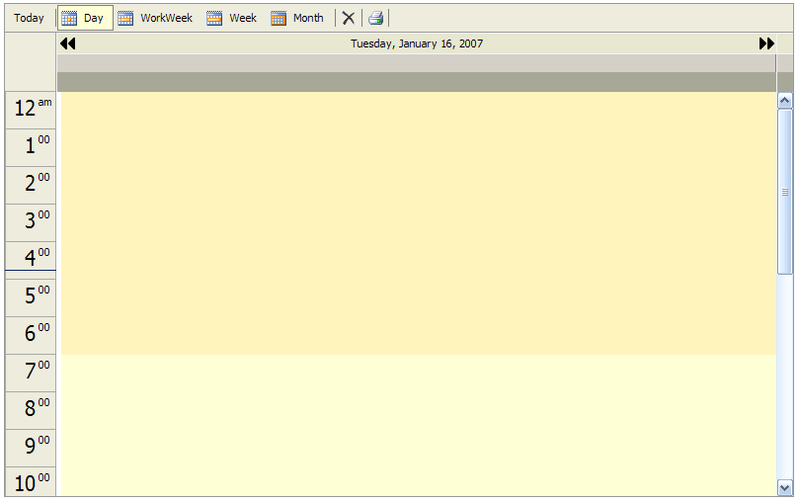 I am using the ASP.Net Scheduler. Yesterday there was not yet an ASP.NET Schedule forum, that is the reason I put my question in this forum. We regret to let you know that currently our Schedule control do not provide support to show or hide time slot, but it is customizable by using GridLines Property. Please refer the following code snippet to customize the grid lines of the schedule. We would suggest to use Month Schedule type to shows only Allday appointment. When hiding the grid lines it doesn't look good anymore. We would suggest you to have a look into the new features of the Schedule Controls in the following link.